Matt C: The first release from DC's Black Label imprint sees the light of day this Wednesday. For those out of the loop, it's unfortunately not a line of premium grade liquor but instead the publisher's need for a place where they can put out-of-continuity 'provocative', 'edgy' tales. For some that may sound like it's just going to allow DC's grimdark tendencies to float to the surface more openly, but with the kind of creators they are roping in, it would be difficult to ignore. 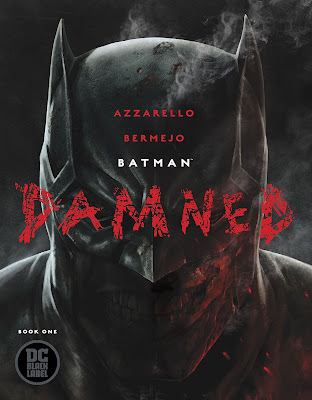 First out of the gate is Batman: Damned from Brian Azzarello and Lee Bermejo. With that team in charge you may get a fairly solid idea of what to expect - especially since the premise revolves around a murdered Joker - but the hope is that DC is taking risks again rather than simply pandering to the grim and gritty crew. If it doesn't hit the spot then at least we can be confident that Tom King will deliver the goods in Batman #55. And if that's not enough, King also brings the penultimate episode of the sublime Mister Miracle to our reading piles. Few books have matched its intense humanity in 2018. Over at the House of Ideas we have the second issue of West Coast Avengers. The debut was even more fun than I expected (and I expected fun!) so I'm pretty confident that Kelly Thompson will keep up the stellar work, causing us to laugh and thrill all over again. If that's not enough, it's the next instalment of the latest Doctor Strange series, with the Master of Mystic Arts... in space! Mark Waid's clearly having a ball putting the good Doctor in some unfamiliar situations and the art from Jesus Saiz is terrific. Fans of the True Believers reprints can also look out for the debut of the Punisher as well as the first team-up of Power Man and Iron Fist at very reasonable prices for classic stories. Andy H: There's already plenty of great Batman reading material out there at the moment so do I need some more? If it's Batman: Damned #1, I think I do! Written by Brian Azzarello with art by Lee Bermejo, the team that brought us the Joker graphic novel way back in 2008, this is the first of DC's Black Label imprint. The Black Label titles will feature characters we know and love but put a darker spin on things and where better to start than Batman. Here, the Dark Knight must team-up with John Constantine to discover who killed the Joker. Bermejo's art is perfect to illustrate the darker side of Gotham's underbelly. This three-issue miniseries is being released in a prestige format but we'll have to be a little patient as it ships on bi-monthly schedule - should be worth the wait though! Amazing Spider-Man Annual #1 takes us back to the early days of Venom, but this time it's from the symbiote's point of view. To be honest I probably wouldn't normally pick this up but it's written by Saladin Ahmed who gave Black Bolt and Quicksilver much needed shots in the arm recently. Immortal Hulk #6 is the start of the 'Green Door' story arc and Al Ewing is joined by guest artist Lee Garbett as the world discovers that Bruce Banner is alive. You just know this isn't going to end well. Finally, it's the end of an era over at Dark Horse as Buffy: The Reckoning #4 concludes the 20 year vampire slaying run at the publisher. It's a shame to see it go: the continuation of the TV series in comics has been a great read and has really captured the voices of the show. We're promised this issue will wrap everything up but will that mean a happy ending for the Slayer and the Scoobies? Stick a stake in me, I'm done.